Super Mario Galaxy was released on November 12, 2007. The game was developed by Nintendo EAD Tokyo, and of course published by Nintendo. Super Mario Galaxy received an "Everyone" ESRB rating with "Mild Cartoon Violence" listed as content for gamers and parents to be aware of. The game released with a MSRP of $49.99, and for nearly 4 years was sold brand new to millions of Wii owners at $49.99. In August of this year, Nintendo announced it was adding Super Mario Galaxy to the Nintendo Selects titles. On August 28, Super Mario Galaxy joined the Nintendo Selects titles and became available for just $19.99 brand new. 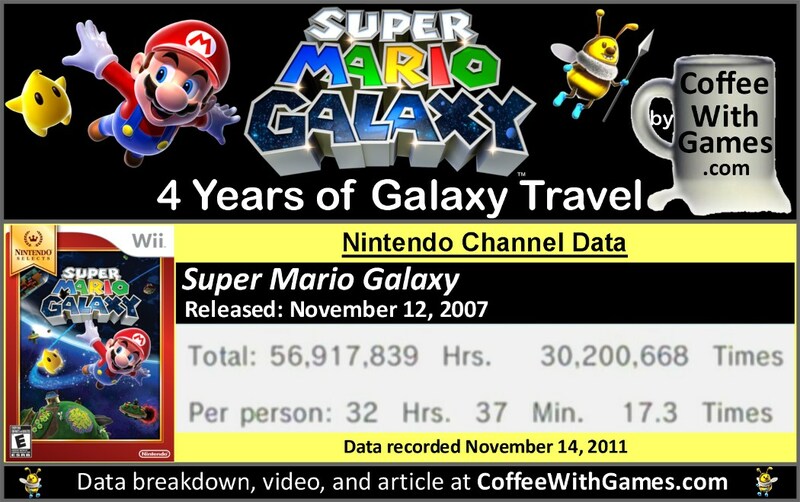 Exactly how many hours has Super Mario Galaxy been played? Well, with November 12 marking the game's 4 year anniversary on the Wii, let's take a look! 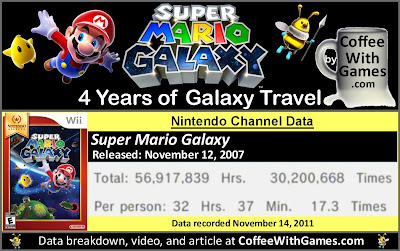 Super Mario Galaxy has 1,745,703 Wii owners that have reported game-play data through the Wii's Nintendo Channel, with 1,463 days possibly reported. When Wii owners are sitting down and playing the game, they play it for nearly 2 hours at a time according to the reported data. The average play-time per day/session for Super Mario Galaxy is 1 Hour 53 Minutes. The game has been received well by "professional reviewers" and consumers alike. The game's "professional" review score average is 97.46% based on 77 reviews on GameRankings.com. SMG has a 4.5 out of 5 Stars rating on Amazon.com, based on 591 customer reviews for the original release. The customer review scores average is 92.25% when the reviews are converted to a 100% review scale. I have mentioned in previous posts that I played and beat Super Mario Galaxy, but I never went back to find all the stars spread around the galaxy. With Super Mario Galaxy having a new price point of just $19.99 though, I think that's a great price for the game. If you are a Mario video game fan and you have not played Super Mario Galaxy, you may want to add it to your Christmas/holiday list now. I am amazed at how many hours we can put into video games, and entertainment in general; as for Super Mario Galaxy's reported data, the 56,917,839 Total Hours that have been reported over the last 4 years are equivalent to about 6,497 years of game-play! Have any of you played Super Mario Galaxy recently? Or, if you have played it, did you only beat it once and never really play it again? If you have not played Super Mario Galaxy, is it perhaps on your Christmas list now that is has a lower price? It's not quite Christmas list for me - but something i'll keep an eye on over this next year. Too much backlog right now, but with the price drop my hope is I can eventually pick it up for like $10 used. Mario Galaxy is definitely on my list and my chances of getting it for the holidays have increased since its price drop. The guys I roomed with before I got married had it, and I played through part of it. Really enjoyed the mechanics and the fun factor. Hopefully by the time I get and play through this one, the sequel will have a price drop as well. I think Robert and I addressed the, "Too much backlog right now..." before, can't that be finished in like two weekends? Then you can have a massive "Chalgyr's Backlog Giveaway!". "Hopefully by the time I get and play through this one, the sequel will have a price drop as well." Yea, not sure how Nintendo is basing what games to add to the Nintendo Selects titles, and when to add them. I would guess with next year not seemingly having much on the Wii, that it could become the year of "Nintendo Selects" with Nintendo discounting the system to $99, and having a huge selection of games finally at $20. "lol - perhaps. though, most of these titles are digital. No giveaway"
EVEN easier. You just release your account info to the winner, and you don't even have to ship anything! So super easy. *goes to brew pot of coffee in anticipation of MASSIVE Steam contest giveaway! Did you play SMG2 on Wii also? Thanks for stopping by and commenting! Thanks everybody again for the comments/feedback provided! Did you play SMG2 on the Wii also? Thanks for stopping by and commenting!